You are currently browsing the The Pet Product Guru blog archives for the day Saturday, May 5th, 2018. Beware That Sweet Looking Raccoon Can Be Dangerous! Back in the 1990’s I was living in a small condo. I lived on the first floor and there was a car port beneath my unit. All of the plumbing was housed in a wooden encasement under the units. Every time I took a shower, I heard a scratching sound under my tub. As time past, the sound got worse and worse until it sounded like there was something actually scratching a the drain pipe. My next door neighbor also shared the same plumbing. One day I heard a scream coming from her apartment. I immediately jumped up and knocked on her door. She came to the door looking terrified! As she was getting out of the shower, she saw a paw sticking out of the wall next to her shower! Yes it was a Racoon. There was a nest of Raccoons living under our condo units. 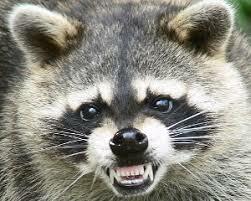 Raccoons have very sharp claws and can claw through many things including wood. The Raccoons were safely removed and the plumbing encasement was repaired. Here in Delaware, I feed several feral cats. I place their food on my porch. If there is food left over, the Raccoons invade at night. My indoor cat Millie gets very excited when they come for their feast! I on the other hand try to get them to leave. I now take any leftover food inside if it is not eaten by the feral cats during the day. Raccoons can carry several dangerous diseases including rabies. While incidents of rabid raccoons attacking humans are rare, it’s not something you want to risk. Raccoons carry two other diseases, roundworm and leptospirosis, that can also be transmitted to humans and pets. The greatest oldies are playing all weekend long on Edgewater Gold Radio! Looking for great variety? Edgewater Gold Radio has it for you. Oldies from the 50s 60s 70s 80s and pop standards and vocals all on one station.! Download the free Edgewater Gold Radio app today! add comment Comments Off on Beware That Sweet Looking Raccoon Can Be Dangerous!